There is a fun show on DIY Network called “I Hate My Kitchen.” I can relate. My kitchen is absolutely dreadful. It needs to be completely gutted and renovated – new layout, new plumbing, new electrical, new cabinets, new countertops, new sink… new everything. Other than replacing the grungy appliances before moving in, I have done very little to the room. I guess I haven't had the nerve to face it. I hate the oppressively low ceiling and the upper cabinets, which make the kitchen feel cramped. Then there is the utterly useless range hood. Because of the low ceiling, the hood is absurdly low -- at just the right height to vent the recirculated air directly into my eyes. I would have pulled the cursed thing down long ago, but the electric hood is hardwired up through the middle cabinet. After my recent success in replacing light switches, I began to wonder if removing the range hood might be within my meager electrical skill set after all. I investigated the options and found that the wiring could simply be capped off. Sweet! While removing the upper cabinets would open up the space, there would be a drawback – more of the ugly kitchen would be visible. I came up with some cosmetic fixes which will hopefully be relatively inexpensive and easy (and which I hope to feature in future posts as success stories) and decided to go ahead with removing the cabinets. I began by emptying the cabinets and removing the doors. Using one of my favorite and most useful tools, the miniature pry bar, I easily removed the paneling and trim from the back of the cabinets. Then it was simply a matter of removing a few screws, and the side cabinets practically fell off the ceiling. I shut off the electricity at the breaker box before removing the range hood and middle cabinet. A horrifying quantity of mouse droppings on top of the middle cabinet proved that at some point in the past, the wire from the range hood hadn’t been the only thing coming through the hole in the ceiling. I've never seen any mice, though; perhaps they were electrocuted while chewing on the wire. I cut the wire short, peeled back the sheathing to expose the three individual wires, and capped each one separately. Before poking live wires into my ceiling, I decided to double-check with an informed person. I snapped a photo and drove to my friendly neighborhood Home Depot. I showed the photo to the electrical specialist; he confirmed I’d capped the wires properly and suggested I add some electrical tape for extra security. Reassured that I wouldn’t electrocute myself or burn down my house, I headed home to finish the job. It’s difficult to properly patch textured walls and ceiling, but luckily, little damage was done when the cabinets came down. I did my best to fill in the holes and sand the high spots. I covered the capped wiring with a metal plate and began to paint the ceiling... and hit my first snag. When wet, the new white paint was exactly the same color as the existing ceiling, so I couldn't tell where I'd painted and where I hadn't. Not good. I'd heard of ceiling paint that goes on pink, making it easy to see where you've painted, and decided to give it a try. My preferred brand, Behr, does not make such a paint (get with the program, Behr!) so I purchased Glidden "EZ Track" ceiling paint. It didn't cover quite as well as Behr, but overall I was pleased. Rolling pink paint over white was MUCH easier than white on white. With a fresh coat of paint, it's hard to tell the cabinets were ever there. Black and white stripes hold special appeal for many goths. Add lace and a bustle effect, and you have a look suitable for many goth and goth-friendly styles, including cabaret, steampunk, Victorian, and burlesque. This project shows how to make a stripey bustle-style valance perfect for your gothic boudoir. 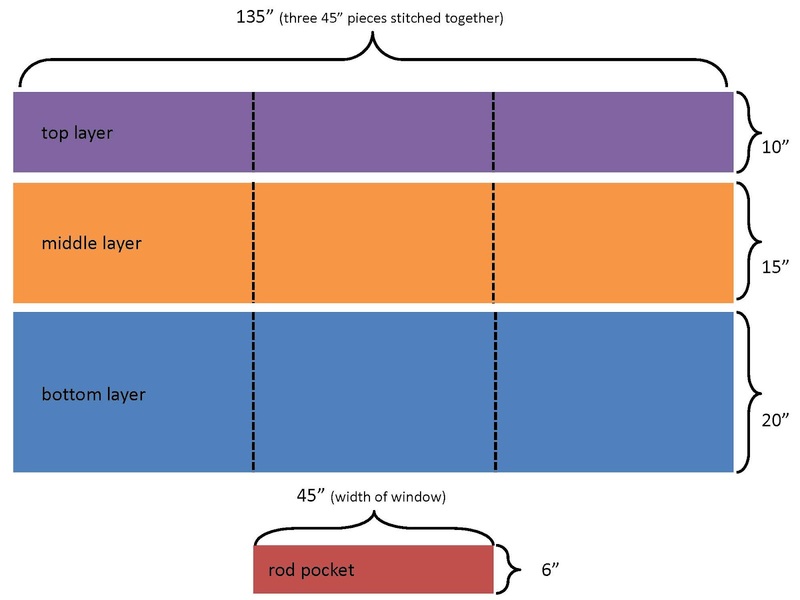 Measure the width of your window to determine how wide your fabric needs to be. The fabric should be about two or three times the width of your window to allow for plentiful gathers. For my 46” window, I used three pieces of 45” wide fabric stitched together. 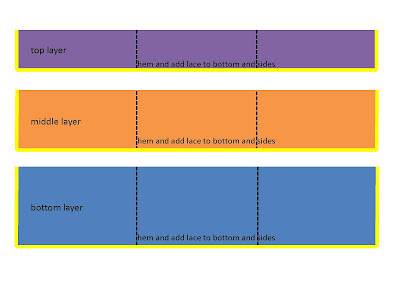 Determine how long (top to bottom) you want your valance to be. I decided on 20”. Allowing for 5” between layers, I needed a 20” long piece, a 15” long piece and a 10” long piece. Measure and cut your fabric. Stitch pieces together to make the proper width for each layer. Serge or narrow hem the sides and bottom of each layer. Add lace. I used 1” black lace over 2” white lace. 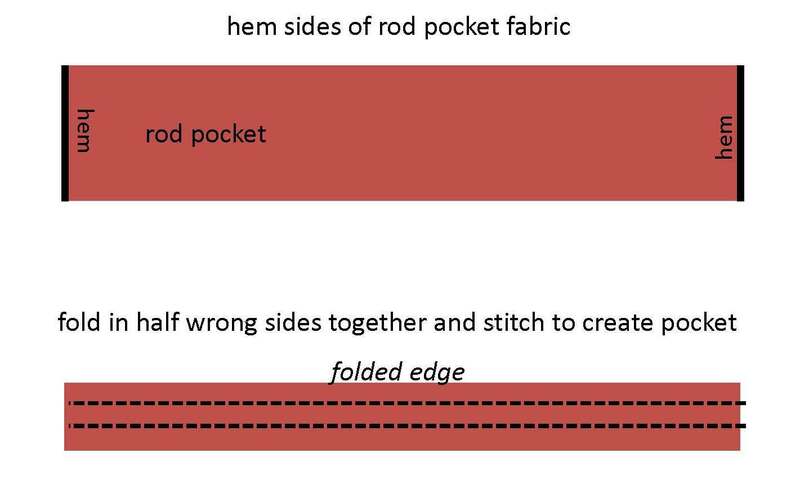 Hem the sides of your rod pocket fabric. 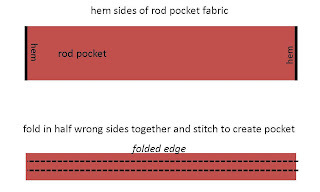 Fold in half wrong sides together and stitch two rows to create a pocket for the curtain rod. I stitched 1” apart to create a 1” header and a 1” pocket for the ½” diameter rod. Gather the layers. With a conventional sewing machine, you can zig-zag stitch over heavy thread and use it as a "drawstring" to gather the fabric. 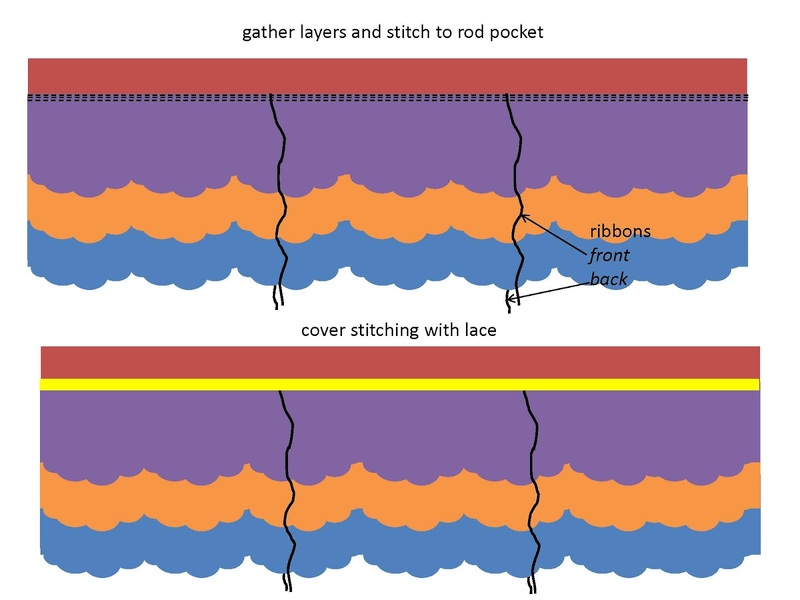 With a serger, you can use the differential feed and a shirring foot to quickly gather each layer. Setting the differential feed at the highest setting and making two passes through the machine with each layer gave me just the right amount of gathering. 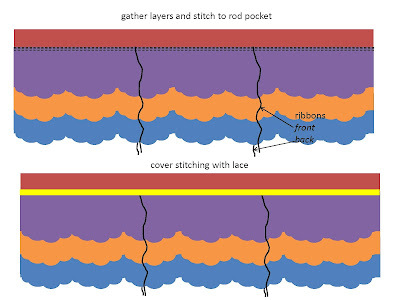 Stitch the gathered layers to the rod pocket one at a time with parallel seams a minute distance apart. While stitching the top layer, include pieces of ribbon to the front and back of the valance. These will be used to create the bustle effect. I used two pairs of 24” ribbons. Add lace to cover the stitching. Hang the valance and tie the ribbons to bustle it up. You could pin on bows at the bustle points for extra sauciness.